The world abounds in famous buildings that are known for their architectural and historical value. They catch the fancy of people who have a keen sense of architecture and appreciate the beauty of such buildings. Many of them don’t just stop at admiration, but go on to replicate and build miniatures of these cityscapes and buildings. Online forums and websites are a great source of information if one wishes to build or collect miniatures. These sources provide complete details about the materials needed, the methods for constructing miniatures, and even some tips as well. One such online source is the website strongholdminiatures.co.uk, which has been established with the sole purpose of helping both amateur and expert miniature creators. This website has detailed instructions and methods for recreating cities and buildings and comes to the rescue of architectural enthusiasts around the world who are into creating miniatures. The website has been created by a miniatures expert himself,inspired by the tale of Gulliver’s Travels, who shows keen interest in replicating both modern and traditional buildings and complete cities. Due to the rich knowledge and experience that he has gained over the years, the website has become a comprehensive guide in creating miniature buildings. 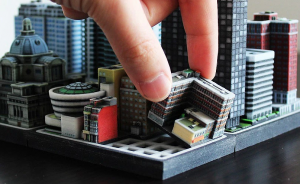 Miniatures of cities and famous buildings can be built in numerous ways. Generally, fixable board pieces are available, which then are fixed together to create a miniature. This is the easiest way to construct a miniature. The instructions that accompany the pack need to be followed to construct a building or sometimes a complete city, though this type of miniature construction does not appeal many. However, miniatures can also be constructed from various other materials such as wax, resin, metal, wood and glass, using appropriate tools. The complexity of the miniature construction increases with the different materials. Miniatures are fun to construct and replicate for lots of reasons. First and foremost the sense of achievement of reconstructing a famous building is immense. It makes the person who is involved in reconstructing such miniatures feel proud and creative. It also keeps the person who is replicating occupied for hours on end. Most people typically practice constructing miniatures of cities and buildings as a hobby. It is an excellent hobby for people who take pride in creating things on their own. Many hand techniques such as sewing, carpentry, wiring, plumbing and many more, are utilized to create miniatures. Miniature buildings are commercially viable as well. Miniature making is simple yet challenging. But the prospects for marketing the finished product is nice perk to this engaging hobby. 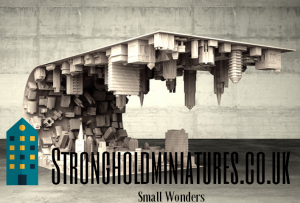 A miniature maker can always refer to websites such as strongholdminitaures.co.uk for guidance and tips for creating one’s next masterpiece.